I really don’t like standardized tests. Ever since I became a teacher, I’ve found the notion of a norm-referenced national standardized test to be completely antithetical to the idea that each learner is unique with his/her own set of gifts, experiences, and passions. Over the past several years, I have been looking for a logical proof to demonstrate once and for all that standardized tests and the data they generate have virtually no value. Well, I’ve finally found the proof, and I want to share it with you. The proof is simple. If a student earns a 70% on a standardized test, there is no way to know whether that student has mastered only 70% of the content or whether that student was just trying at 70% of their capacity. For this reason, a standardized test can only be used to measure a student’s maximum potential for a given (unknown) level of effort. 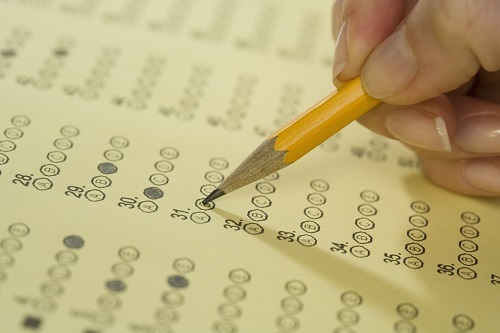 The big (wrong) assumption is that every student is trying at 100% of their ability every time they take a test – all teachers knows this isn’t true. The data is only useful if we know each individual student. This simple fact highlights the path toward the proper solution, which is individualized instruction – something we have all been preaching (and not been doing) for a very long time. If we truly took the approach of providing an individualized educational experience for every student, we would realize that we don’t really need or want standardized tests anyways. But what about data? Don’t we need data? Well, good data is easy to generate if we ask the right questions. What if we asked, “How many books have you read in the past six months?” or perhaps “On a scale of 1 to 5, rate how much you enjoy reading.” Now that is data we can really use! The more we test, the worse this problem gets. Students (and teachers) are already frustrated by school. Forcing students to take standardized test three times a year to “show growth” only exacerbates the problem and will undoubtedly produce worthless data. Teachers are asked to pour through this meaningless data and change their instruction accordingly. Handicapped by “analysis paralysis” teachers will innovate less and begin simply teaching to the tests. Is this the future of education you were hoping for? Me neither! The simple solution is to make tests engaging. Make standardized tests fun to take! Give authentic, meaningful, intrinsic (or even extrinsic) rewards to students who demonstrate improvement. Change the language and expectations. Let’s tell our students (especially our poor students) how amazing and smart they are. It isn’t fair to have high expectations for students if we don’t believe it ourselves. We can do this – let’s go team! I agree completely with the rationale for why standardized tests are a horrible way to measure student. Students definitely don’t try 100 percent because they often don’t feel motivated to try. I’m all for standardized testing reform, but I’m also planning on sticking to methods that will keep me in my job and out of jail. Great points, Matt. My frustration with the broken system often leads me to turn to hostile tactics (out of a pure desire to help children as quickly as possible). That said, what I suggest would cause a major disruption and presumably cost teachers and school administrators their jobs. In light of your comments, I have changed my blog post to reflect another, more positive (although presumably slower) solution to the problem. Thanks for caring enough to write the comment.